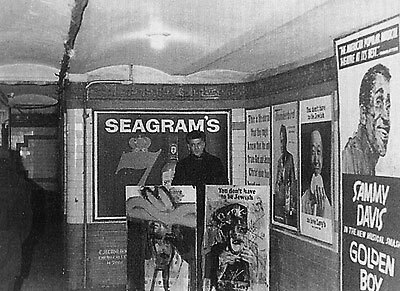 B&W Photo on Paper, 8x10"
COMMENT BY BORIS LURIE: Herb Brown is pictured there in the New York Subway station photograph, fronting the holy advertising posters; he seems content and proud of his unseen, unshown accomplishments. Then - he'll be smearing and designering over them, the Jewish boychik, across "You don't have to be Jewish to eat Levy's" (...or to eat Levy?). Ages of New York breakneck time later, the New York subways/scary tunnels will become raped with an artistic infection - both un/art-establishment-aspiring and dollar-aims-indifferent--of a mass nature: a veritable blood letting (disgusting-like to working people traveling the deeper runways) which nonetheless pushed into this world (at great physical risk) the one and only (seemingly to this date) genuine art movement--and one not grafted out of the pioneering Modern Art History volumes.